A window into your home when you're not there; peace of mind when you are. This year, connected video cameras are must-have items for parents, homeowners, pet-owners, second-homers, away-from-homers… everyone, in fact. And why not? Connected video cameras are an incredibly engaging way to keep up with what matters at home. They're now smaller, more powerful, less obtrusive and more affordable. And, as part of a smart home security system, they can help you verify an alarm and even catch an intruder. So, which is the right smart video camera for you? As you do your research, here are some features you should look for. Every connected camera should be able to stream footage of your home directly to your smartphone. Many cameras go further, allowing you to remotely pan and tilt your view, view in low light conditions, and view footage from multiple cameras (even at different homes) on the same screen. If something happens at home, your video solution should be able to instantly alert you. A good connected camera will detect motion, begin recording, and send you an alert or email with the video clip so you can see what's going on. When your video camera is part of a multi-sensor smart home, your video monitoring becomes smarter and more convenient. For example, you don't want an alert for everything – so you can customize what triggers an alert. Contractors arriving or kids coming home? Yes please – your camera will use the door code or alarm panel as the trigger to record. Dog getting up to look out of the window? No alert necessary. It's your home, so you make the rules. You can even use your location as a trigger for complete control over your video solution. Alarm.com's Geo-Services lets you pause recording when you're at home, and start again when you leave, all based on your smartphone's location. Many of the events you'll want to monitor for – particularly security-type events – take place outside your home, where most connected cameras are susceptible to weather and connectivity issues. 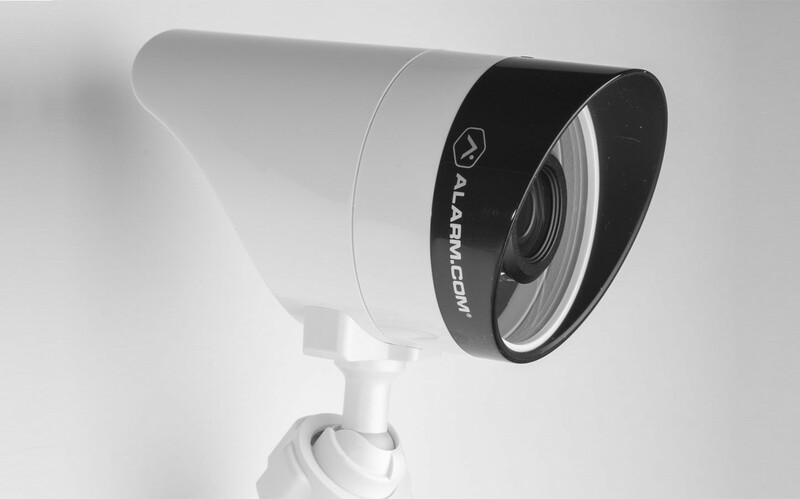 Here, you need an solution like Alarm.com's new outdoor wireless camera. Our new camera features a sleeker design, improved durability, and a high outdoor weather rating, meaning that it captures everything no matter what the weather: ice, rain or humidity. Best of all, a trained security professional can install this camera for you, taking care of mounting, wiring and connectivity while you stay warm indoors. Interested in a connected video solution? Click here to connect with a local Alarm.com service provider.